Carmel reached the golden milestone this year 2019. Since its inception in 1969 reaching this pinnacle of glory came with commitment, perseverance, the will to win and the desire to succeed. This institution prides itself with selfless service to the community catering to the academic pursuits of 1000s imbibing precious values along the way. The school celebrated this glory right through the jubilee year with a series of events from the opening Drill Display to Interschool Competitions culminating in the grand Finale on the 18th January 2019 at the Sabah Al Salem Theater-University Campus. It was a kaleidoscope of entertainment with a musical, the release of the jubilee magazine, a golden jubilee song by the ex-students and a tribute of love by the teachers. 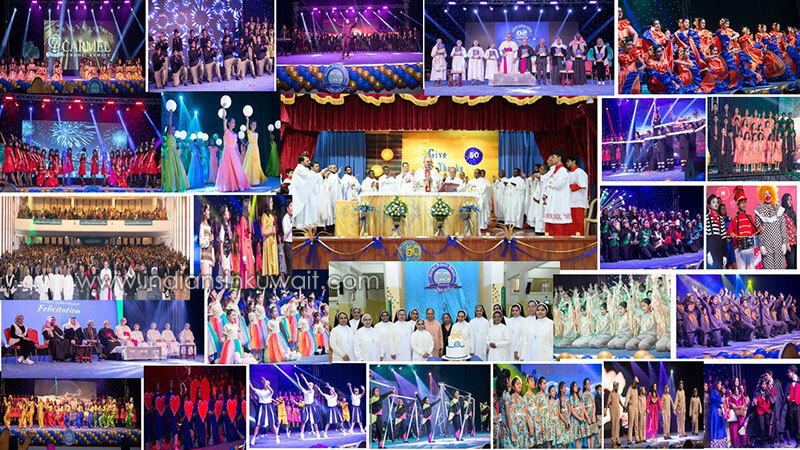 This mammoth venture encompassed 1100 students from grade II-XII in vibrant costumes performing to electrifying beats much to the delight of the audience. The function was presided over by the Vatican ambassador, H.E. Archbishop Francisco Montecillo Padilla, the Indian ambassador to Kuwait H.E. Shri K. Jeeva Sagar and H.E. Bishop Camillo Ballin . Carmel was honoured by the presence of the Apostolic Carmel fraternity, headed by the Superior General Sr. M. Susheela A.C. and dignitaries from the clergy, Ministry of Education and Kuwait University. This golden glory gave us an opportunity to look back at the past with deep gratitude, the present with passion and the future with hope to the journey that lies ahead.